Located in Haifa, MadaTech, Israel’s National Museum of Science, Technology, and Space, is Israel’s largest science museum. Established in 1983, MadaTech is housed in the historic landmark, "Technion building", located at the heart of a 7 acres green campus in mid-town Haifa. The campus also features the Northern Garden, where the palm tree planted by Albert Einstein in 1923 still stands. The Noble Energy Science Park is located on the campus yard and not far from it is the CinematriX and the laboratory department of MadaTech’s education wing. Visitors are welcome to use the parking lot located at the northern part of campus. 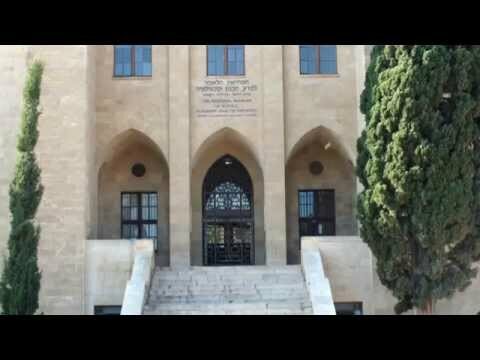 Designed at the turn of the 20th century, by renowned German Jewish architect, Alexander Baerwald, MadaTech was originally home to the country's first academic institution, The Technion, Israel’s Institute of Technology. Every year MadaTech sparks the curiosity and interest of over 400,000 guests in science and technology. Guests who visit can look, feel, explore and enjoy over 20 exhibitions featuring more than 600 hands-on exhibits, and watch 7 Cinematrix multi-sense 3-D movies 362 days a year. Within a school year, MadaTech delivers 300 educational sessions to more than 2000 groups, in our 7 educational centers. MadaTech operates 6 demonstration halls and 12 well equipped advanced labs. In Addition, MadaTech deploys 3 equipped mobile labs, that travel throughout Israel bringing science to life and inspiring the young minds of 150,000 students countrywide. At MadaTech everyone can explore, experience, discover and learn through play and fun.